Established in 2013 and licensed by the Malta Gaming Authority, Guts is one of the better sportsbooks we’ve come across in our research. As a primarily European-facing online sportsbook, they are available worldwide, but not to the United States, sadly. They even accept Australian and Canadian currencies, to name a few. When it comes to their casino, Guts has a large variety of games – one of the largest we’ve seen actually, and from top software developers like Microgaming, Betsoft, IGT and Leander Gaming. It will be hard to beat this selection at other online casinos. They also have a racebook and poker room available for those who are looking for a one-stop shop for all of their betting needs. When you’ve decided that Guts is where you want to want to play and want to sign up, you can fill out their brief personal information form and you’re ready to make a deposit. Deposit options available include Visa, Mastercard, Skrill, Neteller, Paysafe card, Ecopayz, and Sofort. Deposits are usually processed instantly, and includes different options for different countries and currencies. If your preferred deposit method isn’t on their list, they urge you to reach out to them so they can look into adding it as an option for the future. When it comes to withdrawing your winnings, Guts has fast payouts that usually are released within 1-2 days. E-wallet options produce same day withdrawals, so you can receive your winnings faster and easier than other methods like credit cards and checks. Everyone loves membership perks, sometimes, if the perks are good, it’s what keeps you around and continuing to play. Guts Loyalty Squad is an exclusive club, and membership to the club is highly regarded by Guts. They offer priority payouts, anniversary bonuses, your very own personal squad manager for VIP customer service matters, a special welcome bonus, offers and promotions, a birthday gift bonus, and personalized gifts and tickets to hospitality events. It pays to be a VIP member at Guts – and they don’t let you forget it! 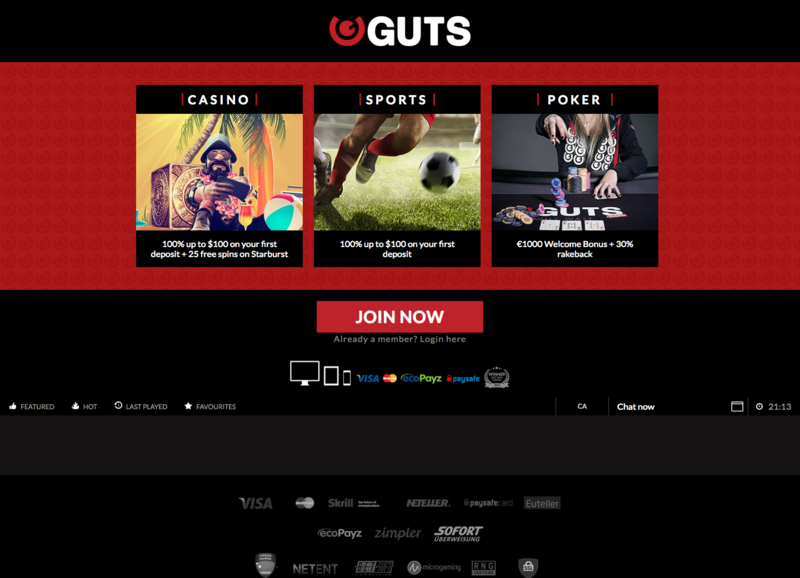 It’s easy to use Guts sportsbook on the go – you just head to their mobile site on your internet browser and you can take advantage of all of the features you would on a desktop computer. They require no downloads or apps to play, and is available for Android, iOS and Windows devices.